Our warm hospitality, world-class lodging, gourmet restaurants and more than 600 miles of shoreline offer endless opportunities for your conference or family reunion. 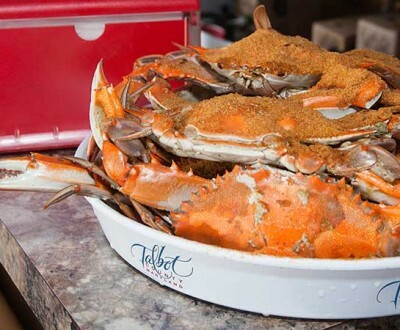 After your meeting, feast on Maryland steamed crabs, charter a boat for sportfishing or sightseeing, bike through the countryside or try your hand at kayaking. Explore our antique shops, boutiques, art galleries, theaters and museums. Bring the family and stay a few extra days in Talbot County. You’ll go home rested, relaxed and inspired! 1. Hospitality. We love hosting groups for conferences and meetings who’ve traveled from near and far, and we look forward to hosting you. Our industry professionals are ready and waiting to make your trip a great one: smooth, accommodating and pleasant to both host and to attend. Don’t know where to begin? Contact us at the Tourism Office — we’re on hand to answer every question you may have. 2. Accommodations. Whether you’re looking for a group of four or 400, we’ve got the space for you. Charming bed-and-breakfasts, state-of-the-art hotels and conference centers, and everything in between. Take your pick. 3. Delicious Eats. From catered crab feasts to white tablecloth dining, boxed lunches and gourmet dinners, your group won’t go hungry here. We have the freshest seafood on the shores of the Chesapeake Bay and award-winning restaurants. 4. Tranquility. Between our scenic views and our Main Street towns, a trip to Talbot County is a transport to sweeter, simpler times — with all the convenience and luxury of the 21st century. Kick back and relax, and let the sights and sounds of the city life fade into the background. Here, the brightest lights provide navigation for the ships on the water, and the only honking comes from the geese — but the WiFi is ample and the cappuccino is flowing. 5. Sweet Treats. Our boutiques, chocolatiers and catering professionals make putting together your swag bags easy as pie. Pick up custom chocolates, individually wrapped goodies or screen-printed items, all of which make for perfect take-home trinkets for attendees. 6. Traffic Ease. Traffic is for the birds, and you won’t find it here. Don’t worry about sky-high rates for parking, competing for a cab or general gridlock. Logistically, Talbot County is a breeze to navigate, which means you can save your energy for the conference room. 8. After-Hours Fun. Talbot County has the talent and the venues to offer your guests and attendees plenty to do when the day is through.